*Tina Schlenker, who was originally to perform the role of Zerbinetta on 12th and 14th, is unable to perform due to her condition. Alternatively, Cyndia Sieden is taking her place. Please refer to New National Theatre News. Available from Sunday 6 October, 2002 at 10:00am. The Most Unexpected Combination of Tragedy and Comedy! "The Opera of 'Operas'," a Collaboration with the Poet Hofmannsthal, Which Has a Happy Ending in Love after Much Fuss and Shows the True Worth of the Opera by Strauss! Ariadne auf Naxos (Ariadne on Naxos) is the third in the NNTT's Straussian opera series after Arabella and Salome. This is a unique opera by the celebrated partnership of Richard Strauss and Hugo von Hofmannsthal, whose collaborations all caused a sensation one after another when the operas were published. The two originally published this work in the form of a play within a play for Moriere's play Le Bourgeois Gentilhomme (The Would-be Gentleman). Partly because of its length, however, it was unfavorably received, and as a consequence, they immediately reworked it in its entirety and turned it into an opera serial based on Greek mythology whose setting is laid in the house of a nouveau riche in Vienna. In the prologue, backstage preparations for the performance of an opera are under way to present it as entertainment for a banquet that follows. An elaborate work has thus been created in which a comedy and a tragedy progress simultaneously. This opera is brimful of fascinating Straussian music, including Zerbinetta's aria "Grossmachtige Prinzessin," which uses coloratura and is a prodigious piece of vocal virtuosity, and a duet by Bacchus and Ariadne. The forthcoming production of Ariadne auf Naxos will be directed by Hans-Peter Lehmann, a pupil of Wieland Wagner, and the orchestra will be conducted by Kodama Hiroshi, a talented conductor who has produced excellent results at various opera houses in Germany. 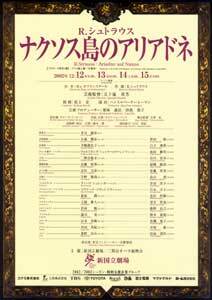 Kodama will continue to conduct following Salome. Lehmann and Kodama will depict Strauss's music drama brilliantly. In the prologue, the first half of the opera, backstage preparations are under way. The setting is Vienna in the 18th century. A new tragic opera Ariadne auf Naxos is scheduled to be staged for a banquet at the house of a wealthy man. Having heard that an opera buffa with songs and dances by harlequins will be performed after the tragic opera, the music master feels disturbed, and in the midst of the confusion in which opera singers and clowns are at odds with each other, the master of the house asks too much of the music master on a whim by ordering him to perform the tragedy and the comedy simultaneously. The actress and dancer Zerbinetta tells her fellow harlequins about this order and they decide to try to improvise to make the performance exciting, while the music master tries to calm down the singers and decides after all that all they can do is to follow the order. In the second half of the opera, Ariadne auf Naxos is staged as a play within a play. The setting is an isolated island in Greece, called Naxos. Abandoned by her husband Theseus, Ariadne is deeply grief-stricken and wishes to die. The harlequins console her in vain. Zerbinetta sings an aria of life and love for Ariadne to comfort her. At this time, a trumpet rings out, heralding the arrival of Bacchus. Ariadne, thinking that Bacchus is a god of death, gives herself to him, but he is carried away by her beauty and kisses her. Then her longing for death turns into hope for life, and new love is born.